A spritz of perfume in the morning is like the finishing touch to your look so for me it is important that my perfume reflects my mood just as much as my outfit and makeup does. I like unique scents so I steer clear from the cult classics because I was something a bit different that not everyone is wearing. With the change of season maybe you are looking for a new perfume and I would definitely recommend either of these to switch your scent. This is a dark and sultry scent perfect for night time. It's musky and sweet but still has a spicy jasmine undertone to it. It's strong but without being too heavy or overpowering, it's like understated elegance. It is great if you want a sultry night time perfume but are still young so don't want anything too overpowering. 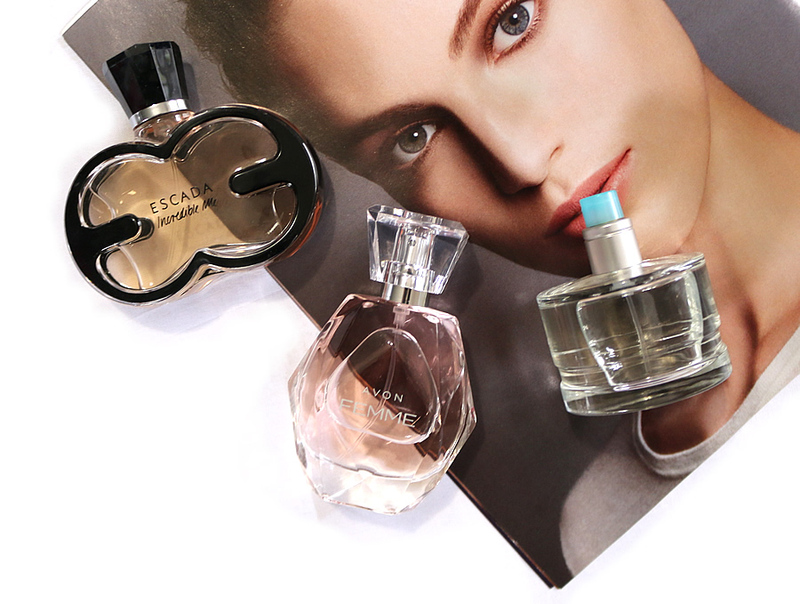 If you are on the hunt for something a bit lighter then you can browse around some of the other Escada scents because they are also known for their fruity summer time perfumes. A fresh and floral scent that is barely there so perfect for everyday wear. It's very feminine and light with hints of sour strawberries and sweet vanilla. It is one of those spray and go perfumes that you can't go wrong with and the chic crystal bottle with pink perfume inside is so beautiful sitting on a vanity you won't forget to apply it. You can read more about this product and purchase it here. While this scent is still fresh, it is a lot muskier and a more neutral than Avon Femme. It almost has a masculine touch to it. The best way I can describe the smell is that it is smells like freshly washed in the shower with light and crisp scents. It almost has a citrus element to it like grapefruit and musky cologne but still girly somehow. You can read more about this product and purchase it here. So to wrap up; I would recommend the Escada scent if you are edgy and go out on the town often, Avon Femme for a girly girl looking for an everyday scent and Mary Kay if you want something fresh and neutral.